For high-quality walk in bathtubs in the Minneapolis, Minnesota, area, turn to the trusted professionals at U.S. Patio Systems and Home Remodeling. We sell and install top-of-the-line walk in tubs that are aesthetically pleasing and can provide a safer bathing experience. 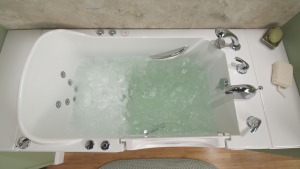 After having a walk in tub installed, you’ll have greater peace of mind knowing you’ll no longer have to worry about slipping and falling while entering or exiting your tub. Not only do the walk in tubs we offer boast these outstanding safety features, they also can provide a spa-like environments to relax in. With a heated seat and a water jet therapy system incorporated into the tub’s design, you’ll be able to forget the stresses of your day and simply enjoy your bath. Plus, your new hot-tub-style bath may even reduce symptoms of common ailments like arthritis, back pain, sciatica, and other painful conditions. To learn more about the high-quality walk in bathtubs we sell and install in the Minneapolis, MN, area, contact U.S. Patio Systems and Home Remodeling today. Our specialists will gladly answer any questions you have and can tell you more about all of the exceptional products and services we offer.